Whew! Today is Day 100! 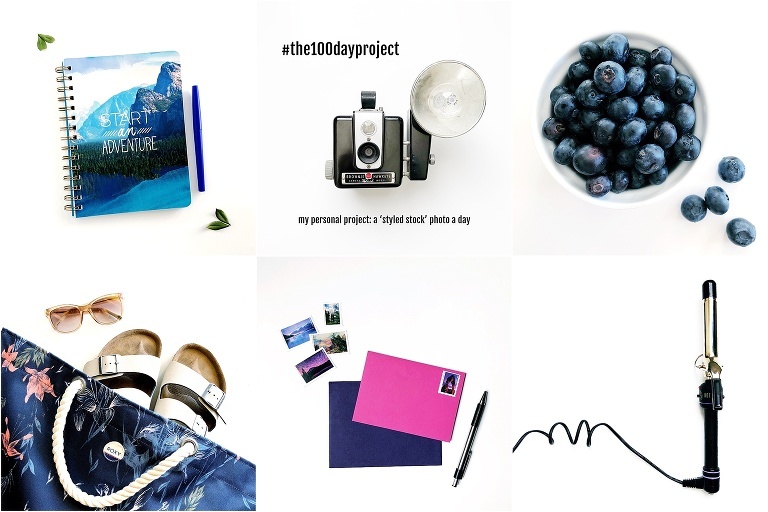 The 100 Day Project is officially OVER! You guys, this has been a crazy endeavor. This project has helped me strengthen my styling skills, learn more about what my audience likes (thank you Instagram polls! ), meet new people on Instagram, engage with my followers more, and it even got me a PART TIME JOB as a product photographer for a company here in Golden! Honestly, I had no idea where this silly little project would take me when I started 100 days ago and it’s been full of surprises. This project has definitely had it’s ups + down so I wanted to recap everything, while it’s still really fresh, with a blog post. 1. You will never run out of ideas. This was the most surprising to me. I began the project with a list of about 20 ideas and hoped the momentum of the project would naturally create the rest. There were days I woke up and thought ‘well, this is it… I have nothing left‘, but an idea always appeared. As hard as it is for me to trust it, this project has been proof that the ideas will always come. 2. 100 Days is a freaking long time. You guys, it is SO long. Before I entered into this, I tried to wrap my head around what 100 days meant, but I basically had no idea what I was getting into. After the initial excitement + newness of this project wore off (around Day 7… hah), I felt EVERY SINGLE DAY of the hundred. 3. You have enough time. It’s true, you do. During the first week, I got a comment on Instagram that said “I wish I had time to do a project like this.” Did this person really think I had ample time to take this on? I have FOUR jobs, two kids, we had two trips scheduled, and not nearly enough hours in the day. In short, if it’s something you want to do, you make time. 4. Even if it’s something you enjoy, you will not enjoy it every single day. Yup. There were days I loved styling a photo and days I dreaded it. 5. It’s important to take breaks. Doing this every single day, with no days off, made it very clear to me how important it is (for me) to take breaks. Breaks help me mentally refresh which is important to avoid burnout. 6. Just because I like something, doesn’t mean everyone will like it. Every day I posted 2 photos with an Instagram poll. On some days, I was CERTAIN one photo would be more popular than the other and the results would shock me. This happened over + over again! Basically I learned I can never predict what everyone will think! 7. You can’t please everyone. A big lesson I learned (an extension of the point I shared above) is there’s literally no way to please everyone. I cannot style one photo that EVERYONE will love. It made me think of the saying: you can be the juiciest, most delicious peach that ever existed, but there will still be someone who doesn’t like peaches. So true. 8. Batch working is my jam. Over the years I’ve learned to get more and more efficient in my business and the key is batch working. Whether it’s holding mini sessions, scheduling social media posts, or writing a month’s worth of blog posts at once… batch working helps me stay on top of things! And NOT batch working this project… instead showing up every single day and repeating the same tasks (setting up my space, doing almost identical edits, etc)… was SUCH a valuable exercise in endurance + patience for me. 9. You don’t NEED to buy more things. Get creative with what you already own. For this project, I was clear that my budget would be $0. This meant I needed to get creative when I was searching for ways to style my photos- I had to look at my own, everyday possessions with a new eye. It was a fun creative challenge! But this applies to LIFE in general- how can you re-purpose things you already own instead of purchasing new items? 10. There are a few simple styling tricks I used over and over again. sticky tack: during the first day, I was styling Easter eggs (that’s how long ago this challenge began!) and quickly learned the value of sticky tack. I used it again and again. white posterboard as a reflector: a couple weeks into the challenge, I started using a second piece of white poster board as a reflector to lift the shadows. I ended up using this simple trick almost every day! texture: adding a bit of texture to an image (like using crumbs or zest) really added a lot of visual interest and those images were more popular in the polls too. white space: photos that had more white space tended to rate better overall. In summary: This project was harder than I expected, but very rewarding and I’m glad that I did it! I don’t think I’ll be doing another one next year… but never say never, right? If you want to embark on your own 100 Day Project next year, you can get all the info here (it’ll begin again next April! ).